Designed specifically for testing of sun beds and the W/m2 Eeff (Ery) limits set out in the new EU regulations of a maximun of 0.3 W/m2. 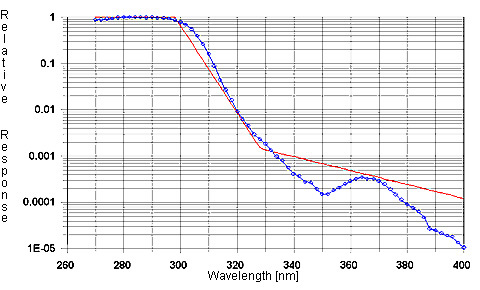 Interference filter coating (Metal Oxide) blocks UV above erythermal response as show on Spectral Sensitivity Graph. Press and hold push-button switch on face of unit. Aim sensor window in top panel of meter directly at UV source. For tanning beds place meter at body position. Note reading on LCD and record if desired. Wear eye protection when checking UV lamps (UV-block wrap around glasses). Allow lamps to warm-up prior to taking readings (at least 5 min). When checking aging of lamps, keep measuring distance and locations constant. Lamps should be replaced when output drops 30% to about 70% of their original (new) readings. Take overall reading at exposure distance, or check individual lamps close to surface. Keep track of hours vs. readings on a chart. If unsure of what original new values were, replace lamp(s) with new ones of the same kind and compare to old ones. To determine percent UVB divide Model 6.2 reading by Model 5.7 total UV (UVA + B) reading. When checking UVT acrylic transmission, take reading through acrylic; then remove acrylic and hold meter sensor at approximately the same distance from lamp as the acrylic shield was located. If acrylic blocks much UVB it should be replaced. 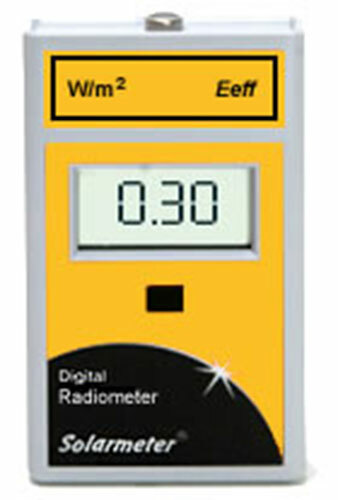 When using this meter to compare different type lamps, due to their different spectral power distributions, the readings should be considered relative rather than absolute. Although higher output lamps of similar SPD's will generally read higher than lower output lamps, ones that peak near 290-300 nm (as does the meter response) will read higher than ones peaking near 313 nm even if the total UVB output of both is the same. 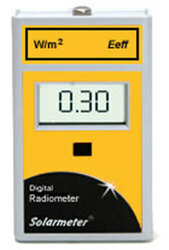 Do not subject the meter to extremes in temperature, humidity, shock or dust.